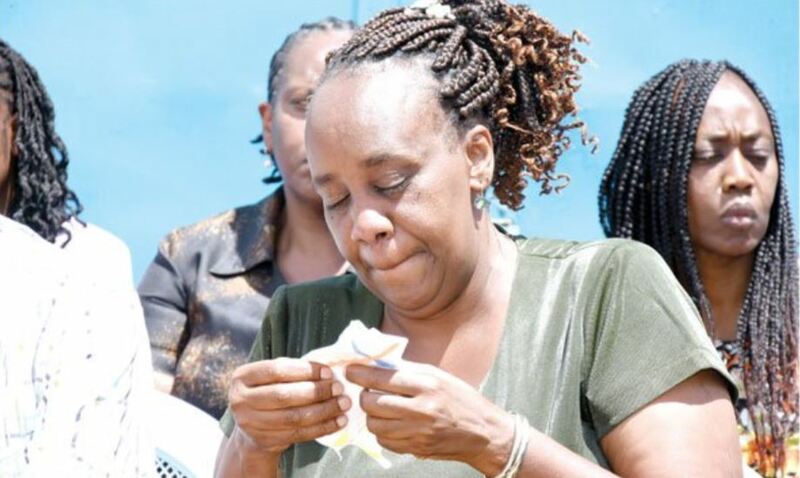 The mother of slain student Ivy Wangechi over the weekend moved the country to tears when she bravely faced the press to defend her daughter’s honor against false reports about her firstborn child. Speaking on Sunday at their Thika Makongeni Phase 10 home, Winfred Waithera teared up as she appealed to bloggers to stop spreading false misrepresentations about Ivy Wangechi. “It is with a lot of regret that I have learnt of an Ivy that only exists in the world of social media. That must be another Ivy, not my daughter. “I want to make it clear that the Ivy the bloggers are talking about and trying to portray in a bad light in social media is not the same one we knew. The Ivy we knew was God-fearing, disciplined and one who did not depend on or have sponsors,” said the grieving mum. The pain stricken mum further stated that her trainee doctor daughter was not infected with HIV/AIDS and any contrary claim was a rumour. “We are still in shock and cannot believe that Ivy is gone forever. It is so hard to imagine that we will never see her again. It is so painful for us as parents and family,” added Waithera. Following her address to the press, media personality Ciku Muiruri has related to her pain as a mother and penned an open letter. The author wrote the letter on her socials, drawing hundreds of comments and reactions from other Kenyans. OPEN LETTER TO WINFRED WAITHERA (IVY WANGECHI’S MUM). It may not seem like it now, but be sure your daughter did not die in vain. Because of her, we now SEE that mental health issues are REAL and must be taken more seriously. Because of her violence against women and blaming the victim will NOT be tolerated. Didge is serving a suspension from his job because of it. Jalang’o saw the error of his ways and deleted his post. Because of Ivy, we know that not everything you read on the Internet is true. Anyone can do it. Even you. Start a blog right now. Write anything you want. It will be on the Internet. That does not make what you write true. Because of your daughter people will begin to question what they read. They will look at the source. They will wait for a credible media house with the proper facts before they murder another person again with their words. Like they did to your daughter.